We help people discover products that address life s needs and inspire you to enhance your life. From home goods to gym essentials and audio accessories, move life forward with products designed to match your grit and speed. -CeSunlight A8 Clip Light provides full spectrum lights and no ghosting, thus offering a more natural lighting experience. 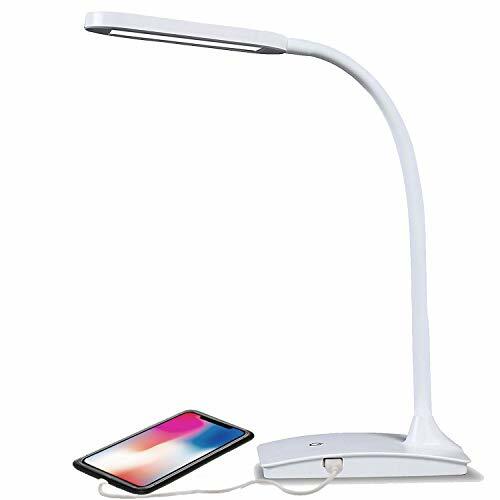 -Its 3,000K to 6,500K adjustable color temperature and 2 brightness setting provide 6 kinds of light source, paired with the Smooth Illuminating Diffuser will keep eye strain at bay so you can keep reading, working, or studying with minimal exhaustion. -Sturdy clamp conveniently clips onto desks, shelves, bed headboards, and more. Easy to move and fix in different spots. 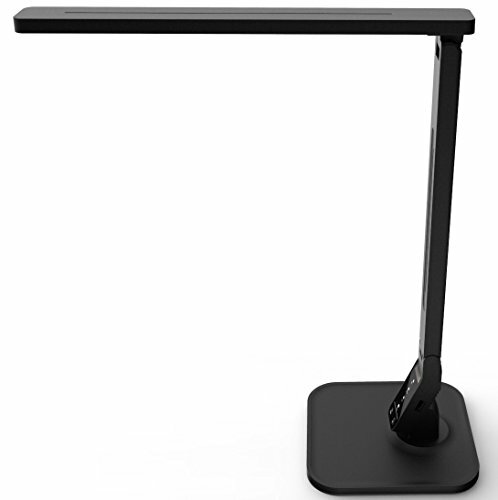 -Flexible and Infinitely Adjustable Neck for ease of positioning the lighting angle as you want. MOST COMFORTABLE LIGHTING SOURCES: 3 Kinds of Color Temperature, warm light (3000K), warm-white light (4500K) and white light (6500K), each CT has 2 levels of brightness, so that it create 6 illumination modes, meet all your requirements. Clip on bedside or headboard and reading in bed, comfortable light brings you comfortable life! BEST LIGHTING QUALITY AND PROFESSIONAL EYE CARE: Led lights always flicker at non-full load mode, that's why some other desk lights flicker at low brightness. 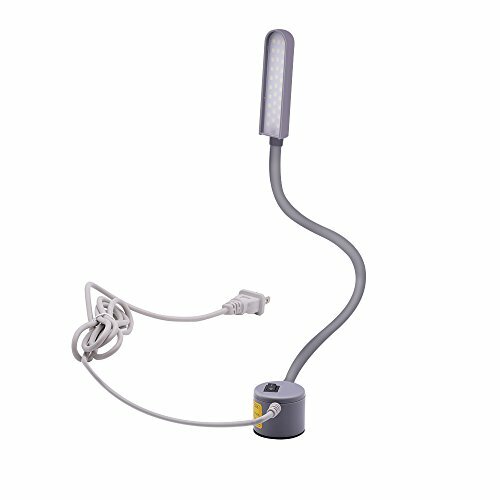 Our flexible gooseneck lamp functions are well controlled, uniform luminance, no flicker, no dazzle, protect your eyes, ideal for reading, drawing, work, study. UL CERTIFIED AC ADAPTER AND USB CABLE INCLUDED: The table lamp comes with 4.8 feet USB cord, no more worry about the distance between the table lamp and socket. An AC adapter is included, which is UL certified, much safer than some other adapters, be at ease! CLIP AND STAND DESIGN: It is easy to clip on your work bench, desks, headboards or other object. Thanks to the padded clamp, it won't scratch the object it attaches. With the extra padded base, it can also stand stably on your table. We offer a 60-day money back guarantee & 3-year warranty, why not give it a try? Add to cart now and grab it at this sale price! 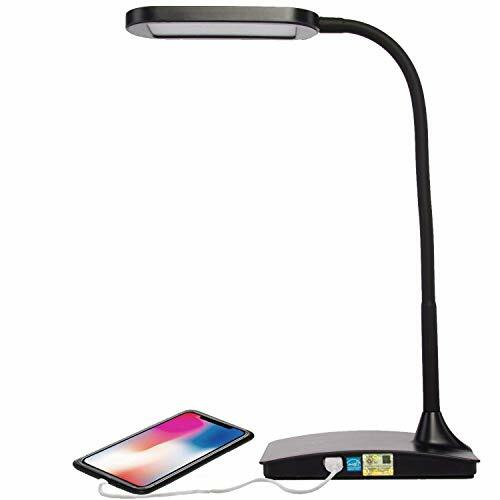 The black LightView PRO Colors Edition Magnifier Table Lamp comes strongly recommended for anyone facing challenges due to macular degeneration. The 3-diopter magnifying lens brings an entire page into focus - there's no need to move a book or newspaper around as you read. Ideal for use as a craft lamp, LightView PRO lets aging eyes see intricate embroidery close-up once more! We make our Magnifier lens of genuine diopter glass; cheaper units only paste plastic magnifying sheets onto ordinary glass. Brightech's high-quality 3-inch diameter lens magnifies 1.75 times - eliminating eyestrain for elderly readers. 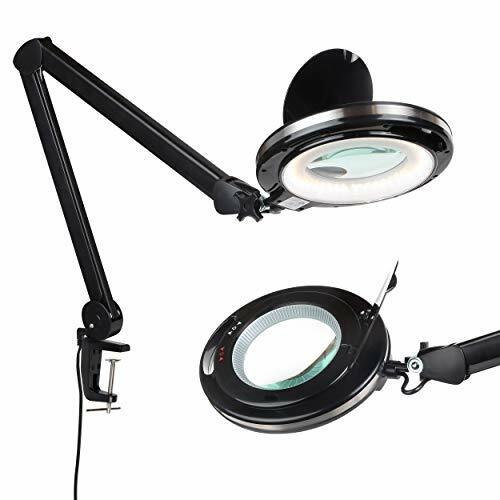 There are less expensive magnifier lamps out there, but none of them has the quality or workmanship of a Brightech lamp. None of them has the vivid daylight hues of power-bill-saving LED. The 90 LED lights embedded here use only 9 watts altogether - a model of efficiency! MAGNIFYING LAMP FOR AGEING EYES, WORK & HOBBIES: This lamp comes equipped with a genuine 3 diopter glass magnifying lens. Paired with the bright light of the LED's, it will magnify objects 1.75x or 175% bigger than their original size. To achieve the perfect level of magnification with a 3 diopter lens, the lens should be positioned further away from the object being magnified. It works well for activities like knitting, machine sewing, coloring, and much more! HANDS FREE PUZZLE, SEWING & WORKBENCH LIGHT WITH STAND. GOOSENECK -LIKE SWING ARMS SET & KEEP MAGNAFYING HEAD IN PLACE - Forget handheld! Arts & hobbies such as knitting, cross stitch, quilting, painting, & drawing become more enjoyable when you can use both hands, plus notice fine color contrast & count small stitches. The cool white light helps your eye see contrast like in natural daylight. ESTHETICIAN LAMP FOR MICROBLADING, FACIALS, EYELASH EXTENSIONS - Spas & salons, makeup artists and beauticians: do you need to work close up, precisely to make your clients look beautiful? It couldn't be any easier to shape an eye brow just right when you can see it brighter and magnified. SATISFACTION GUARANTEED WARRANTY ON OUR MODERN, TABLE TOP CLAMP LAMP: We proudly stand behind all of our products 100%, which is why we offer a full 3 year warranty. If for any reason you are not satisfied with your purchase, please contact us because our number one goal is customer satisfaction and we are committed to making it right for you. 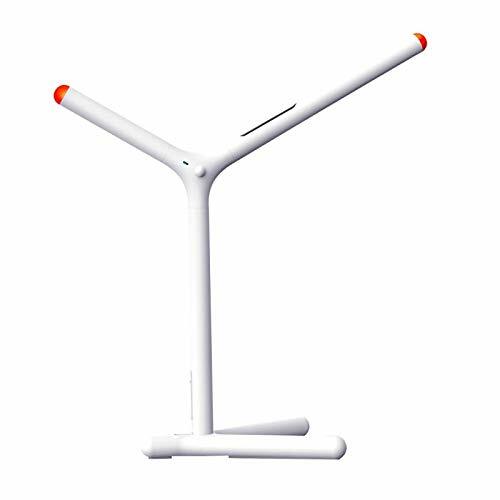 Adjustable Swing Arm Lamp Rotating base, hinged arm and swiveling LED panel helps you manipulate the lamp head in multiple-angles.The adjustable head lamp can be moved 180 up and down, and 360 right and left. 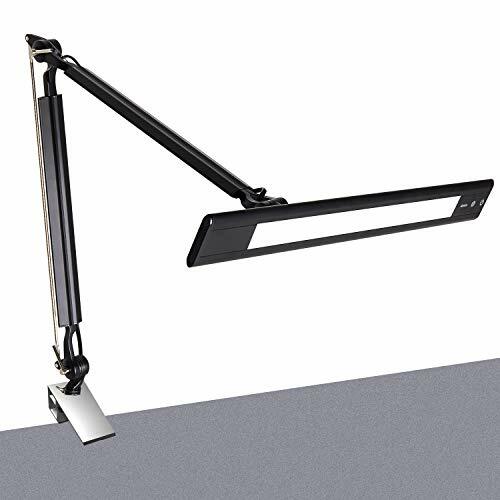 15.7+18.5" extendable long arm can be folded to 21.6"
Space Saving Clamp Design The toughness of this metal clamp lamp can support up to 2/5cm(max) thick desk.. Also, this design can help save the desk space, extraordinarily suitable for reading, office, art workshop, architect, etc. Excellent After-sales Service 5-year Warranty If you are not satisfied with this product please send it back to us within 3 months, our 24 x 7 customer care will ensure with high priority service. 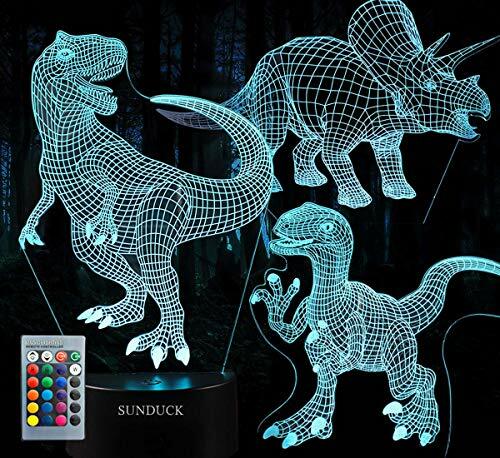 4 Lighting mode and 5 Dimmable Level This wireless LED desk lamp allows to choose among 4 COLOR MODES and adjust the BRIGHNESS to suit your lighting needs. 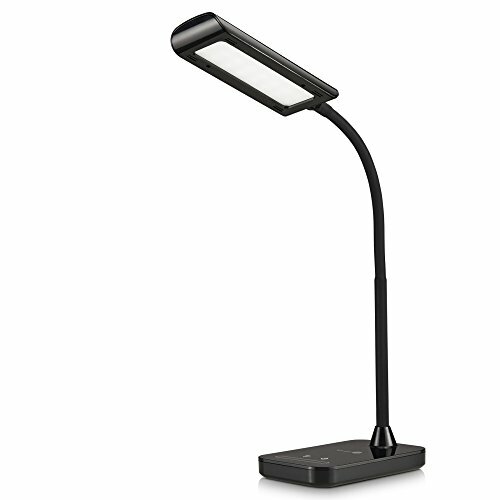 To gain an appropriate lighting requirements this wireless desk lamp can offer 20 different choices! You can choose a soft yellow light as your bedside table, or you can choose intense white light for office as well. Meanwhile warm color natural light resembles like incandescent lamp and halogen lamp which are pleasant for your eyes. Innovative Lamp, Light Up the Life. Versatile Function Design allow you to use it both indoor and outdoor: Portable, foldable, rechargeable, wireless, focused or unfocused light,free rotation of the lamp. It can be used as lantern, flashlight, night light lamp, for room, bedside, camping, baby nursing lamps, perfect as supplementary light for most situation. Indoor- Bring brightness & happiness into home! Bedside Night light: Stretch it into a lantern, bring soft light for your family. 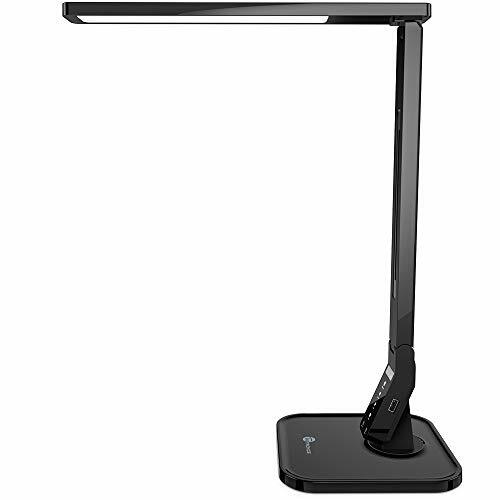 Reading Lamp: Rotate the lamp at flashlight model to focus light on what you doing,like reading at desk, bed. Wireless lamp is easy to take everywhere. Table Lamp: Foldable to keep your table clean,bright enough for your study,work,reading. Outdoor- Enjoy the beautiful lamp outdoor! Give up the utilitarian lanterns! Tent Lamp: Lighten your tent for family camping. Flashlight: illuminate the road you walk,the garden,the way to go back home. Collapsible and Portable: By rotating and compression,the lantern can be collapsed for easy take. Stable Quality: IP67 water proof, only need pay attention to the charging port not immersed. The shade is made of PC, which is the main material of Astronaut Helmet Mask with best quality,durable & anti-Fall. How to use 1. ON/OFF 1)Touch switch beside the charging port and 3 brightness levels adjustable. 2)USB charging port, DC 5V. 2.Turn the lamp into a lantern 1)Rotate the two lampshades counterclockwise. 2)Stretch the two lampshades to about 5 inch distance. 3.Turn the lantern into a flashlight Compress the two lampshades, match the male convex and female slot, then rotate clockwise. 4.Turn the flashlight into a reading lamp Place the stand upright and rotate the lamp as needed. 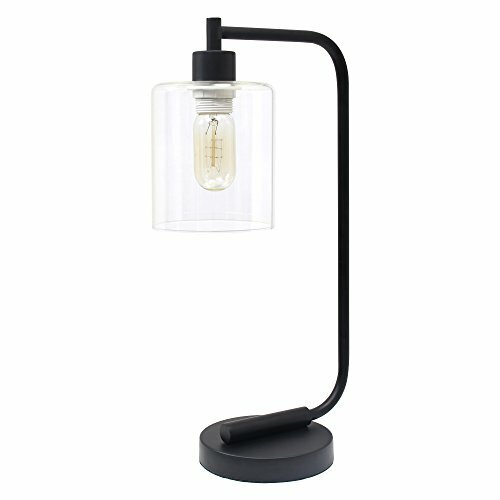 [Cordless Desk Lamp]: This nightstand table lamp is compact and lightweight, only 7.64 x 5.59 x 1.46 inch, easily portable and has a convenient on and off switch on its back. [Rechargeable Table Lamp ]: Built in 1200mAh lithium battery supports 3-24 hours lighting. The real wooden handle is easy for you to take the battery operated lamp to anywhere. [Reading Lamp With 3 Brightness]: Touch Lamp with dimmer for 3 level brightness adjust,3200K warm yellow soft light to protect the eye. [Convenient Bedside Lamp]:Nightstand lamp with usb charging port,safe as night light for kids bedroom,study, playing. The beautiful lamp is also a highlight for living room. 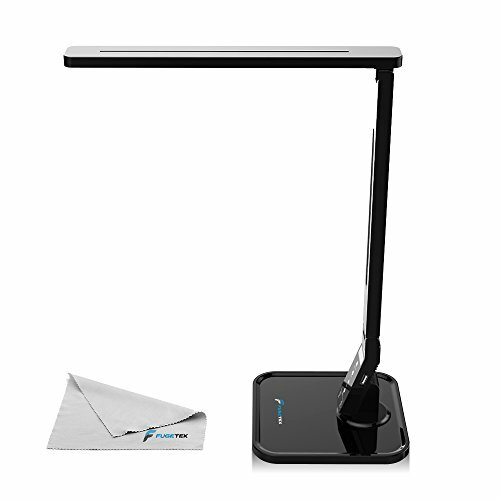 [Versatile Function Lamp]: This stylish desk lamp with multiple function is clean,durable & anti-Fall. Portable, foldable, rechargeable, wireless, focused or unfocused,360 degree rotation. A Perfect lamp for desk,table,rooms,bed,reading,etc. 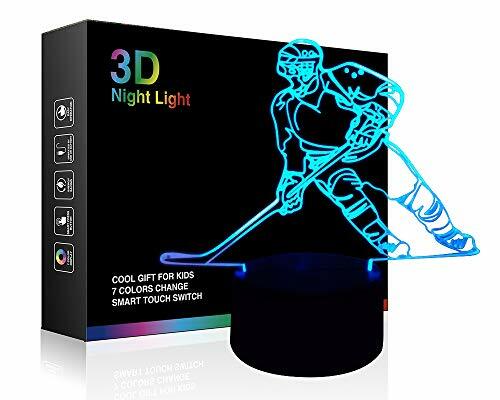 3 Brightness Level: It is dimmable, you can adjust its brightness according to the ambient light, creating a comfortable light condition for your eye. Eye-Caring: 25 pieces mini LED bulbs, 4500K color temperature. Soft light source, avoid eye fatigue caused by flickering light and harsh glare effectively. Adjustable Arm: The arm can be bended to the direction and height you needed, give you better reading experience. 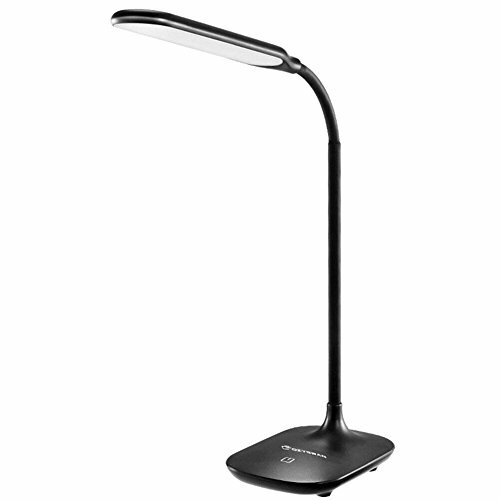 Simple Design & Touch Control: It is designed to be neat and clean, focus on providing comfortable light for reading and writing. Touch control buttom, easy to operate. Safe Power Source: 5V/1A charging port. Multi power source including USB, power bank, laptop, computer. Safe and energy saving. 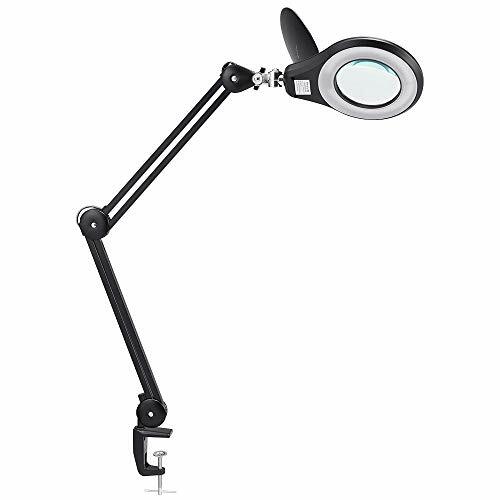 The Eye-Caring modern architect task Lamp has multi-joint and flexible adjustable arm and rotatable 180 head. 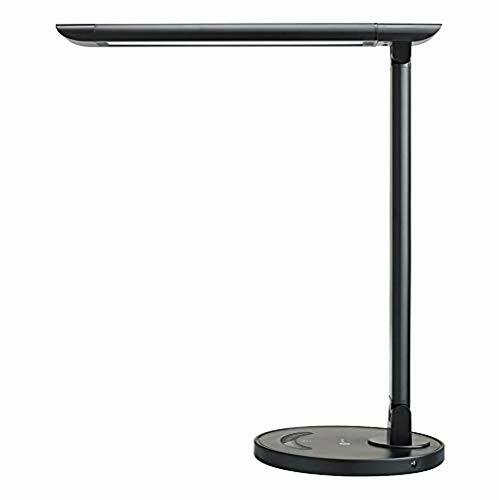 Metal constructed, peal black finish, the task desk lamp look design combine modern and classic style. A rotary switch on the metal base makes it easy to turn ON/OFF. It will bring you the most appropriate light in all directions, You no longer have to worry about myopia caused by the lack of light and the inappropriate location of light. 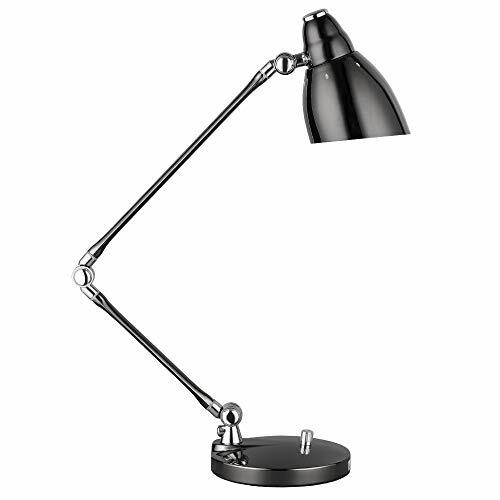 The task lamp It's great used as a reading lamp, daylight lamp, desk lamp, garage lamp, kitchen lamp, essentially anywhere that is needed for added brightness. 1.The desk lamp have a 2 year warranty that we do honor. If you have any issues, questions, or concerns. Please feel free to contact us by e-mail directly, so we can assist you in any way that we are able. 2.About install the lamp: Please unscrew the fixing ring in the head of the desk lamp, and tighten it in the lampshade so that the lampshade is fixed. 3.If there is any problem of quality, such as dent caused by transport,please contact us, we will give you best solution. 4.If there is any missing parts when receiving or any other problem please kindly contact us first, we will support you a best solution! 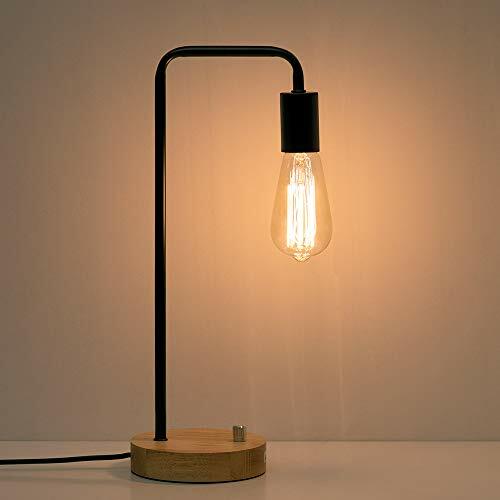 IDEAL LAMP SIZE & SPACE SAVING Lamp size - 21 x 6.6 inches, with 23.5" long swing arm which is a large light area. You can adjust the height of the study lamp at will. Just with 6.6" wide of base which leave more desk space for your own task. 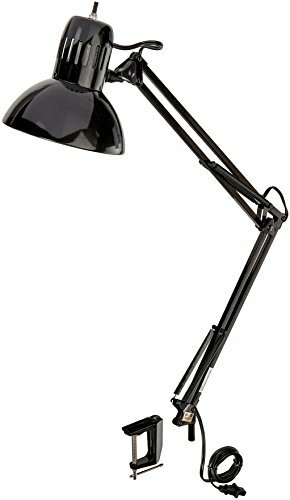 The task lamp It's great used as a reading lamp, daylight lamp, desk lamp, garage lamp, kitchen lamp, essentially anywhere that is needed for added brightness. HIGH QUALITY &ELEGANT DESIGN The task desk lamp with a high-quality peal back metal body, stable base and unique bullet shape shade, which is anti-corrosion and anti-rusting after multi-process treatment, the quality of the lamp allows it to be long last and stylish, beautiful accessory for any room in your home or office. SAFTY TO USE The cord and plug of set of bedside table lamps are UL listed. By being UL listed, this lamp is nationally recognized for its standard of safety. Moreover, the top lampshade has holes for heat dissipation, which avoid overheating hot after a long time to use. With E26 universal standard base and each lamp takes one maximum 60 watt standard base bulb (Bulb not included). 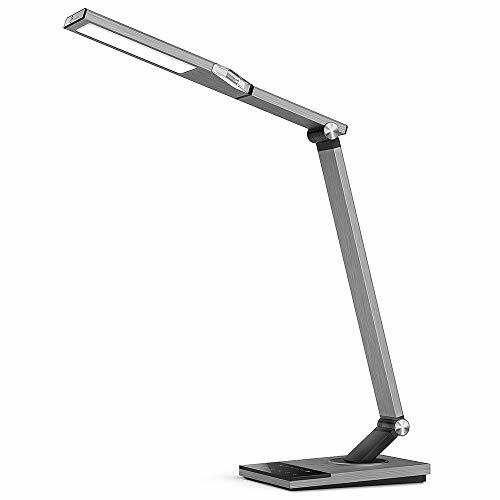 INTIMATE EYES CARING DESIGN The task lamp has adjustable arm and rotatable head. 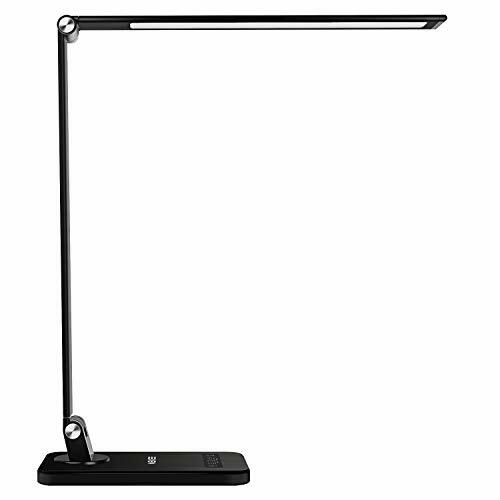 The swing arm is easily adjustable direct the light wherever you need it the most. 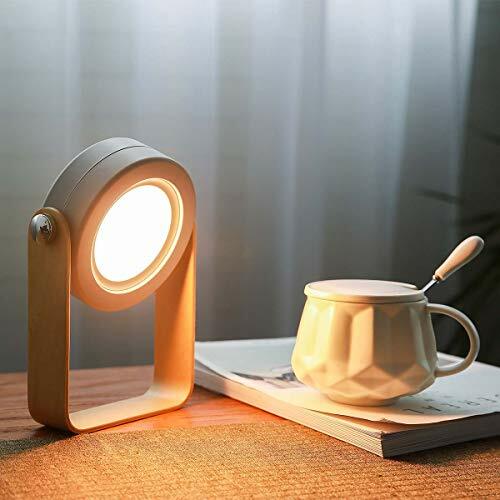 Moreover, the head of the working desk lamp can be rotatable 180 , so that you can get a right light when you are reading.Beside the office desk lamp also produce a nonflickering natural light that reduce eyes strain while long-time working reading. 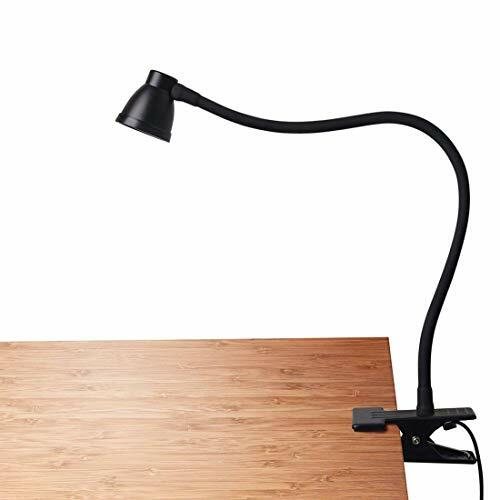 Using a swing arm desk lamp will be good for your eyes when you need to work. 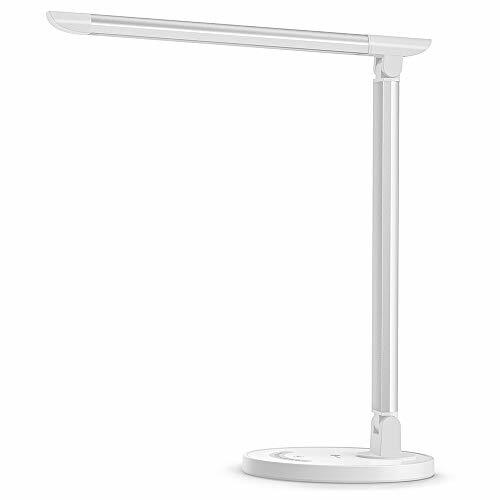 Smart LED desk lamp - It's an Apple HomeKit supported smart desk lamp that you can turn it on/off and adjust the brightness through voice commands and Home app. It also supports setting timers, location free control, dim brightness. 30 minutes - it will automatically turn off. When you come back again, it will turn on at the brightness level when you left. Detachable - The whole lamp is designed in a branch shape, and the shorter twigs can be taken down as an emergency flashlight (please be sure to take off the silicon cover). It's a great help in an emergency power outage. 100% QUALITY LED 30 High-quality LED beads can provide enough bright light and the light is soft enough to protect the eyes.The sewing machine light is durable and can saves up to 90% of electricity. SAFE and STABLE POWER SUPPLY The mainboard of the power supply adopts constant current voltage input to prevent strobing light when in using.Protect your eyes and improve overall performance of the sewing lamp. SILICONE RESIN GOOSENECK We have improved the safety and comfort of our products by added a silicone flexible tube to the metal gooseneck,which is safer and flexible than others normal gooseneck. STRONG MAGNETIC BASE We use the strongest suction magnetic material as the base of the lamp, the LED light can be magnet on any metal surface not slide nor move, also widely used in Lathes, Drill Presses, Workbenches, Music Stands, Craft etc. not just only the sewing machine light. LIFETIME WARRANTY POWKER sewing machinge light are backed by a lifetime warranty.If you have any problems using our products, contact us at any time and we'll make it right.